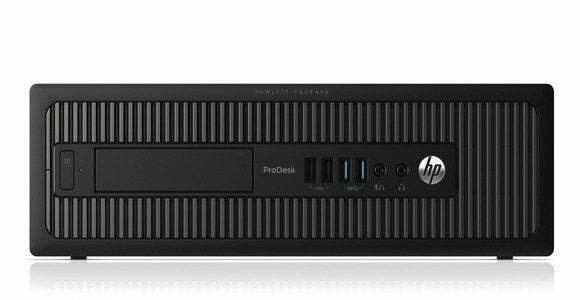 With everyone busy talking about the Xbox One, the PS4, and games, games, games on the eve of the E3 expo, HP has engaged in a bit of clever counter-programming by announcing several new commercial desktop PCs. This all-in-one PC is designed to appeal to IT admins and business-class users, thanks to Intel’s vPro technology that promotes energy-efficient performance, security, and manageability. Systems with vPro use an independently powered discrete processor with its own firmware to monitor system memory. It doesn’t require the system’s main CPU or operating system to function, allowing an IT admin to access a computer remotely even if it’s shut down or unable to boot due to the presence of a virus, operating-system corruption, or other serious problems. The system includes Intel’s fouth-generation Core i5 or Core i7 processor as well as two DIMM slots that enable up to 16GB of DDR3/1600 memory. The 23-inch, 1920-by-1080-pixel screen is available with or without 10-point capacitive touch, and HP offers a myriad of stand options, including the ability to mount it to the wall or on an articulated arm via its VESA mount. The system has the option of including a discrete AMD Radeon HD 7650 with 2GB of DDR3 memory to support up to four displays. There are and storage options up to a 1TB solid-state hybrid drive that include Intel’s Smart Response Technology that utilizes an SSD to cache the older hard disk drives to have SSD-like performance. The system comes with six USB 3.0 ports, one with fast-charging capabilities. Other options include a two-megapixel webcam with a microphone array, and optical-drive options up to a BDXL Blu-ray writer. The EliteOne 800 G1 will be available June of 2013 and starts at $1299 for a touch-enabled screen and $1099 without. EliteDesk 800 in its tower form factor. This little business box comes in ultra-slim, small, and tower form factors. Each system comes equipped with Intel’s latest fourth-generation processor with vPro support, WiDi technology for wirelessly connecting to displays and projectors, and Smart Response Technology to endow mechanical hard drives with SSD-like speed. It will support up to 32GB of DDR3/1600 RAM (16GB on the Ultra-slim form factor). All three form factors have optional discrete graphics with the tower having the most choices. They include the AMD Radeon HD 8350 or 8490, Nvidia NVS 310 or 315, or the Nvidia GeForce GT630. The small form factor has each of those options minus the GeForce GT630 and the ultra-slim has the AMD Radeon HD 7650A as an option. All three form factors will have solid-state drive options up to 500GB and include six USB 2.0 ports, four USB 3.0 ports, Ethernet, and two DisplayPort outputs. The EliteDesk 800 will be available June of 2013 and start at $815. The ProDesk 600 in the small form factor. The ProDesk 600 business machines also come in a couple different form factors: small and tower. Included are some of HP’s security features such as HP Client Security software that encrypts hard drives, permanently deletes unwanted data and restricts unauthorized users. HP BIOS Protection and HP Recovery Manager offers protection from security threats, prevents data loss and provides system backups. Finally, HP Password Manager will store passwords to restricted applications for quicker access. They will have options for Intel’s fourth-generation Core processors as well as up to 32GB of DDR3/1600 RAM. Discrete graphics card options will be available, including the AMD Radeon HD 8350 or 8490, the Nvidia NVS 310 or 315, or the Nvidia GeForce GT630 (available in the tower form factor only). Storage options will range all the way up to 500GB of self-encrypting solid-state storage.